After a review of the Environmental Impact Statement for the marine phosphate mining project at Scorpion Bay known as “Don Diego”, the Secretariat of Environmental and Natural Resources (Semarnat) has officially denied permission for the project. 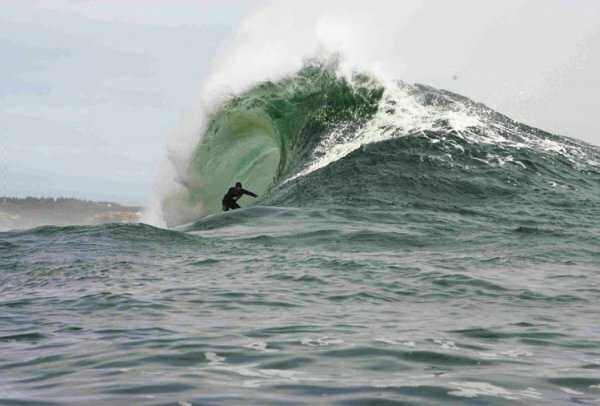 The first time this project was submitted in 2014, Odyssey Marine Exploration withdrew the proposal themselves, stating that they hoped to re-submit after the new state government and municipality of Comundu government took power. However, it appears their strategy has failed. After the decision was leveraged, shares of Odyssey Marine Explorations lost nearly two thirds of their value in the NASDAQ stock exchange. The project, which sought a permit to operate a bottom sucking dredge 24 hours a day, 7 days a week, for the next 50 years, was denied on the basis of severe concern for the safety of several threatened species which call the Gulf of Ulloa home, including loggerhead turtles and grey whales. This latest refusal of Semarnat to grant permission for the project was greeted with a press release from Odyssey Marine Explorations which called the decision “very disappointing” while also stating that they could re-submit the project with modifications. Save The Waves will continue to monitor Semarnat actions in case the project is submitted a third time. In response to public resistance to the proposed “Don Diego” mining project, Exploraciones Oceanicas has issued a defamation lawsuit against the fishing cooperative of Puerto Chales and the reporter for BCS Noticias who reported the story. The claims from Exploraciones Oceanicas are that the resistance slandered their project goals unfairly. There is no response yet from SEMARNAT on the future of this project. Neither is there a response from the Mexican government on whether they will entertain the charges put forth by Exploraciones Oceanicas in a court of law. 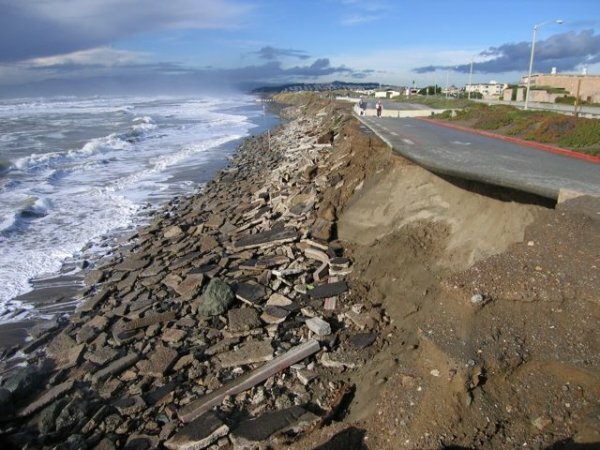 After a suspicious last minute date and location change, which placed the meeting in the middle of the day on a work week, in a small and distant city, the long awaited public consultation for the potentially disastrous “Oceanica” deep ocean phosphate mining project called “Don Diego” took place on November 5th, 2014. 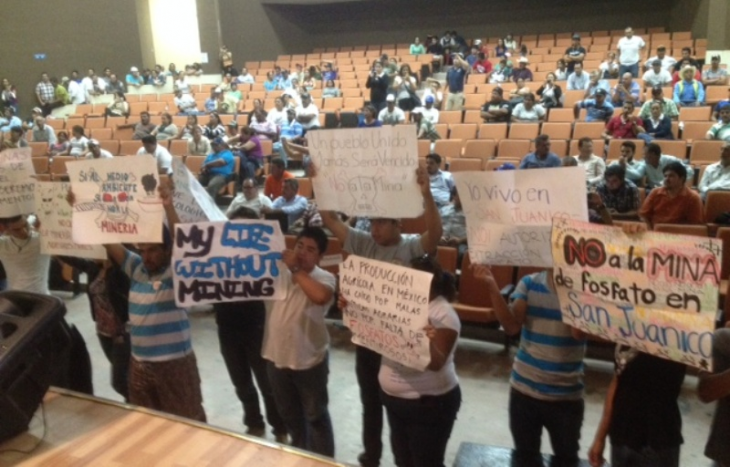 Despite recent catastrophic damage to the Baja Sur coast from Hurricane Marie, nearly 400 courageous local people and many NGOs attended the public hearing to oppose this project. Also in attendance as part of the opposition were local politicians opposed to the project as well as journalists from around Mexico. 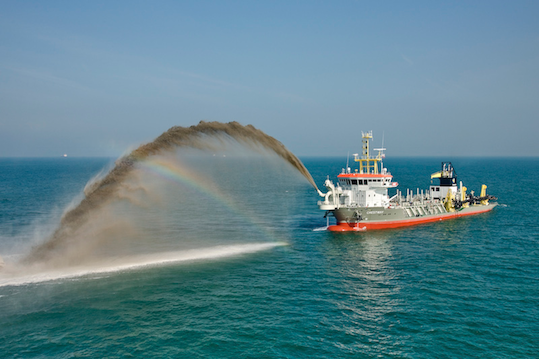 The mining company, “Oceanica” with US based partner “Odyssey Marine Exploration”, unveiled their plans to operate Boskalis dredge ships 24/7, 365, for the next 50 years to remove over 350 million tons of phosphatic sands from the bay and process it into phosphate fertilizer. Despite the unprecedented nature and scale of the project, and multiple identical projects worldwide having been shot down already, Oceanica claimed zero environmental impact and told local people not to worry. Furthermore, the company responsible for performing the EIS for the project is QV Gestíon Ambiental, QV Environmental Management, under the direction of Martín de la Cruz Quijano. Quijano is an ex-SEMARNAT functionary from SEMARNAT’s Environmental Impact and Risk Division. During his tenure with SEMARNAT, Quijano worked for the controversial director Ricardo Juarez who was investigated by the Ministry of Public Service and removed from office by the government of Felipe Calderón. Despite the claims of zero impact by project proponents and beneficiaries, local scientists, researchers and fisherman remain unconvinced and very concerned. The local opposition highlighted some of the many risks of the project, including the potential for dredging to leach cancerous mercury, uranium and lead into the local waters and ecosystem. Other concerns included large sediment plumes from phosphate dredging creating anoxic ocean ‘dead zones’, noise pollution from the project disturbing the area’s sensitive whale breeding grounds and migration patterns, and the economic impact on local fishermen if local fisheries are negatively effected. The proposed project seeks permission to dredge the ocean bottom for phosphatic sands, 24/7, 365 days a year, for 50 years. Despite the unprecedented and controversial nature of the project, not to mention lack of a sufficient enviromental impact study, the project may still be permitted by the Mexican government. Shockingly, it was also shown that the entire project is expected to create only 80 jobs over 50 years, with many of those jobs presumably given to foreigners with the technical training needed to operate the dredge ships. Further insulting the local community, representatives from Odyssey and Oceanica left immediately after their presentations and choosing not to respond to questions from the public, leaving just two people without specific knowledge of the project operations or impact to respond to nearly 400 attendees. “Oceanica” is currently waiting for permit approval, with response expected by the end of the 2014 calendar year. 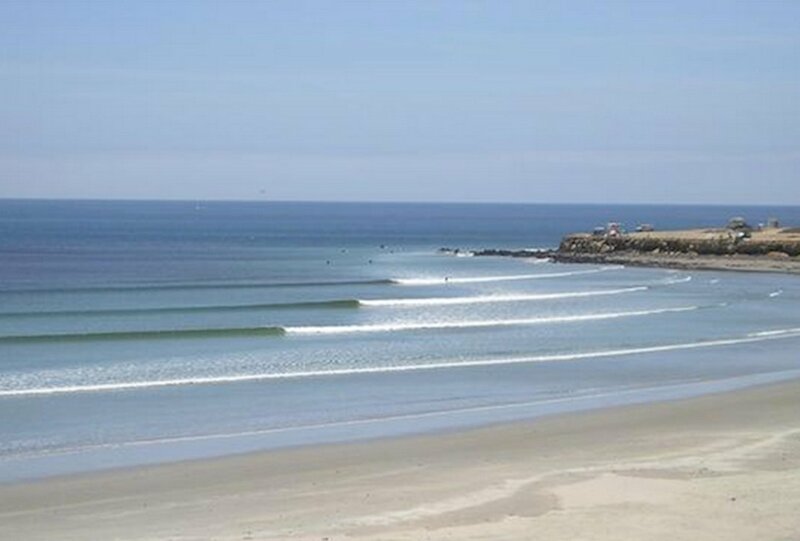 Opposition to this project is crucial not just for Scorpion Bay surfers and local Mexicans but because it will set precedent for all future proposed Ocean Mining projects globally. Mining companies have discovered enormous mineral deposits along coast lines worldwide and this issue is sure to become more pressing in coming years. Exploraciones Oceánicas, S. de R. L. de C.V. has submitted its Environmental Impact Study (EIS) for the project called “Don Diego.” The mining permits allow for phosphate exploration off the coast of Mexico in the Bahía de Ulloa, between Abreojos and San Lázaro. Phosphate is exploited for its value as an agricultural ammendment and is used in large scale applications in the USA and around the world. 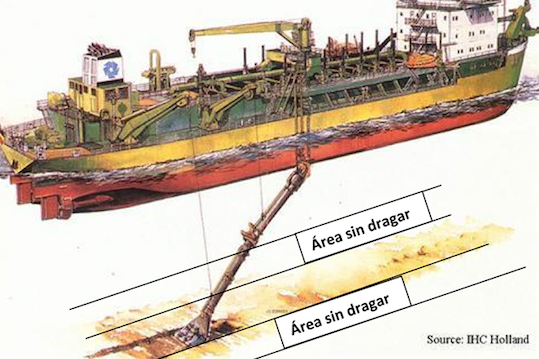 The project proposes using marine dredges to a) dredge phosphatic sand from the ocean floor and b) prepare it for transport using a desalination barge. The work area is located 12 miles from the nearest point to the coast and adjacent to the fishing area called San Juanico. If allowed, the scope of work entails dredge operation 24 hours a day, 365 days a year, for 50 years. Authorities close to the project claim that their EIS has been vetted and approved by multiple NGO’s in Mexico, although none have been found yet who can verify this claim. The proposed mining site is located in an area of ocean long studied by scientists for the abundance of marine mammals that inhabit the area. It holds no less than 5 species of sea turtle, all listed as endangered on the IUCN red list of threatened species, as well as the Red Crabs, the main food source for Olive Ridley and Loggerhead turtles. The region is also considered a hot spot for Black Marlin, Swordfish, and Blue Whales. To contact them, call 212-270-6000 and ask for them by name, the operator will connect you and you will most likely have to leave a message. When speaking to them on the phone or leaving messages, reference the Don Diego Phosphate Mining project in Bahía Ulloa in Baja Sur. Please do not threation or insult these individuals or JP Morgan. Simply leave a message stating why this ill conceived project is a risk to the reputation of JP Morgan and their supporters. What Is Really At Risk? The threat of this project goes well beyond the waves of Scorpion Bay. Projects of this nature and scope are few and far between for comparison. Two similar projects that were previously proposed in New Zealand and Namibia were met with public outcry. The environmental impacts are not completely understood and thus present significant reason for caution and concern if the project is granted. Whales, turtles, and benthic and pelagic flora and fauna all face real risks to their health, as do the industries they support like tourism and fishing. 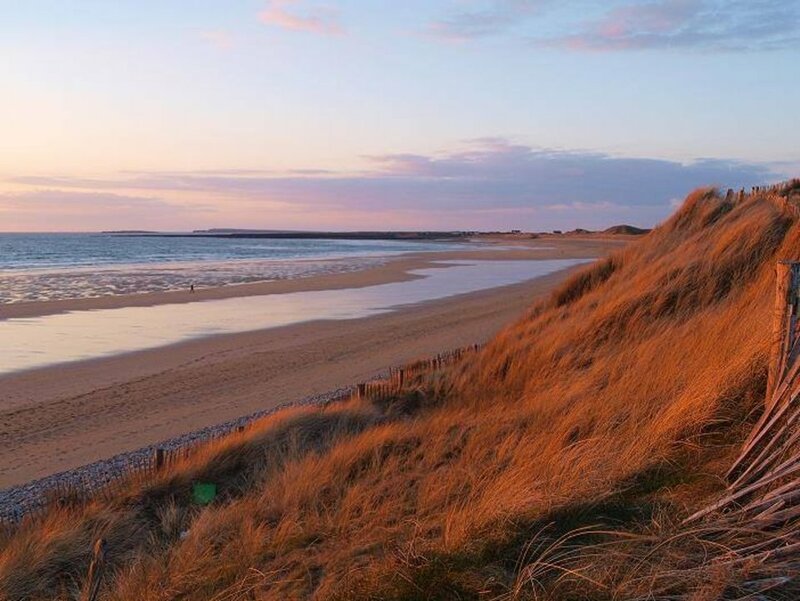 While the waves of Scorpion Bay could be negatively affected by changes in water quality and sand flow, the threats to species biodiversity, foraging habitat, and fishing industry are just as real and grave. 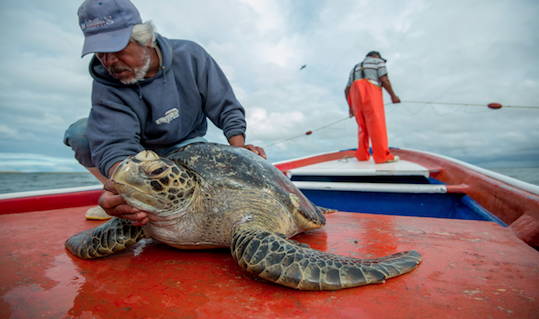 The livelihood of coastal communities along the Baja Sur coast depend on these eco-systems for survival, as do the international fisheries industries of Mexico.